The very first thing one should consider when choosing or building a room for dedicated listening is it's physical dimensions. This alone will effect sound quality more than any other thing you can do. I know, I learned this the hard way - more than once. My listening room at the shop was based on no engineering whatsoever. I knew it would be a bad room before I started. I thought this would be ideal for evaluating our amps in a handicapped environment (the real world) and would prove more enlightening than a perfect room (which few people have). They key in my room was the drop ceiling. Above it I had almost another 12 inches meaning I could go for a 9 foot ceiling height, change two walls and be done. The ceiling height was changed from 8 feet to 8.83 feet (106 inches) That was as close to 9 feet as I could get it. Everything keys off the ceiling height. Here is a pic of the old 12 x 22 room. Standing in the same spot here is a shot of the new room. It has a 6 foot opening at one end with the remainder of the original listening room just on the other side. Flanking the opening with a pair of speakers gives the sound stage almost infinite depth. So as you can see, the room was actually made smaller. The difference in sound is amazing. The two rooms can't even be compared the differences are so vast. The results of this near perfect room were easily measured and it has elevated the sound of my stereo to a point far beyond what it was. 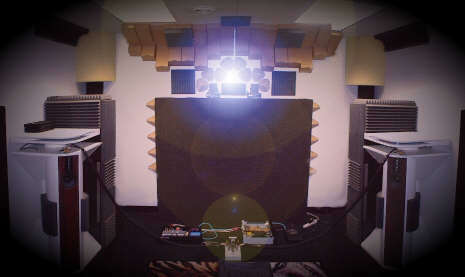 Speakers, amps, sources, cables, power conditioners, and tweaks didn't make enough of a difference in the original room to be worth while when compared to the difference this room made using the exact same combinations of gear. 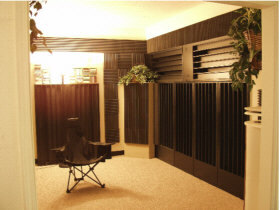 Let me drive this home a little harder... A man upgrades to a $4500.00 source and sees a 15 % improvement in the overall sound of his system.. Then we take him back in time and have him keep his original source, but change rooms on him to something like this. Now he hears a 40% improvement in the overall sound of his system. Then we get him the $4500.00 source he wanted and because he is able to accurately hear it in his new room, he realizes that it makes more like a 25% improvement - not 15%. ! The end result gives him a 65% improvement in the overall sound of his system. The remodeled room cost around $1000.00 with treatments. After spending many weeks with his new room and system the man hears into everything farther and finds out that certain cables he thought he liked he actually doesn't like anymore, and on it goes. If you're accurately going to judge a beauty contest it helps to have 20/20 vision. So study the formulas. See if adjusting a wall or ceiling a few inches or feet can put you into a ideal room dimension. Don't worry about it getting smaller or larger than it is now, it really won't matter. 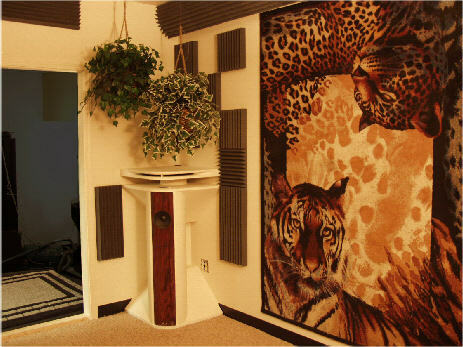 As long as the room fits one of the three formulas it will sound better than good.